"This is an old Sicilian recipe that is a family tradition. They need to sit overnight before baking." Sift together the sugar, flour, baking powder, and cloves. Make a well in the sugar mixture, and pour the eggs into the well. Work the eggs into the mixture, first with a fork, then with your hands, until you have a smooth dough. Line a baking sheet with foil. Roll dough into 1 inch balls and place on the prepared baking sheet, 2 inches apart. Flatten each cookie with the bottom of a glass. Cover with a clean dish towel and let rest overnight. Cookies will spread. Bake in the preheated oven until golden, about 15 minutes. 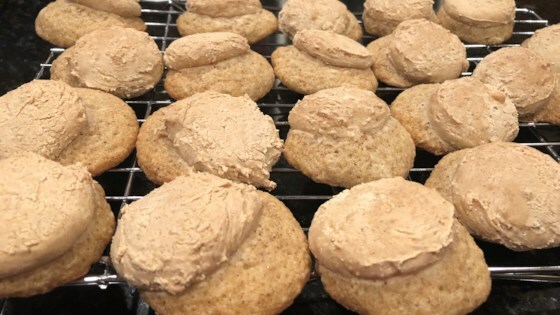 Remove cookies from pan immediately as they come out of the oven or they will stick. Cool completely on a wire rack. See how to make Halloween ghosts and graveyard bones out of meringue. These came extremely hard. I may have done something wrong, but I am not sure what since I followed the recipe exactly. Made the recipe exactly, and the mix was too dry. Didn't really rise and spread as mentioned in the recipe. Cloves flavour is a bit odd - Won't be making this recipe again.